I attended a CAS overview held at my local gun club that involved an informational overview then we all went in the range and fired some revolvers and pistols. I got interested as I've inherited a Colt M1877 Thunderer (.41 Colt), several 1897 shotguns (16 and 12), a double barrel shotgun amongst other guns (mostly single shot shotguns). Looks like I need two pistols and a pistol caliber rifle, besides my shotguns, to get started. I intend to do some matches but don't expect to do it enough to make it a focus. I do 3Gun occasionally as I like the format but not enough to ever break out of the bottom 25% on a stage. Like I said, I'll be learning and having fun. I was looking at a new from Winchester 1873 but there are so many variations, not sure what is best for CAS. There are cheaper options out there but many of my other guns are Winchesters (M1 Garand, shotguns, M1903, etc.) that I wanted to buy the real thing. Spending $1000 to $1500, I'm fine with. I'm thinking of getting it in .44-40 or 45 Colt to match my potential revolvers. I like the .44-40 for it's historical value but having 45 colt would be convenient with the pistols. 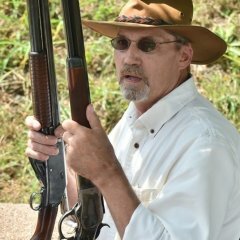 I've been reading that lots of folks are using .38/.357 rifles/pistols, other than cheaper off the shelf ammo, any advantages there? I reload so I expect to do most of my own ammo. Looking at a pair of Ruger New Vaqueros in 45 colt. I'm open to other suggestions. I don't mind spending more for quality stuff. I don't want to spend $3K to just want to spend $3K getting something else. I'm looking for suggestions, advice, links to tutorials, articles and what is the latest developments in CAS. Many thanks all for responding! Yer gonna get a LOT of opinions, and good advice, probably the best being, "Go to a few shoots and try out different revolvers, different rifles, different shotguns, different barrel lengths, and different calibers before you buy anything". My preference probably leans toward a 12g double barrel "coach gun", Marlin 1894, and 4 5/8" Ruger Vaquero/New Vaqueros. Caliber? Wherever the dart falls. Who knows from match to match what I might bring. Maybe an 1873, maybe a '66, maybe a Spencer or Burgess, maybe something else. Or cap and ball revolvers just as often as not, or some oddball shotgun. Fast guns won't make me fast, so I find my fun other ways. Other folks are going to have different preferences, and their choices might not be your choices in the long run. Try out whatever you can before you buy. Best choice is to try out some of the options and see what you like, and what fits you best. Were I buying new today, and I hope to be again sometime this year for a 45 colt 73, and a pair of 45 Rugers, I'd be looking hard at Long Hunter Shooting Supply. Or one of the other smiths that specializes in guns for this game. I love my 38/357s, but variety is the spice of life! Do you read all of a person's post? "I﻿ reload so I expect to do most of my own ammo." Best advice I can give is go to a couple more matches before you buy anything. Welcome to the game Tubby, Have a blast!!! Welcome! Before you spend a small fortune on guns, leather, a cart and lots of reloading supplies...go get yourself a good hat. That will tell you a lot about your commitment level to this game and what you expect to get out of it. For the rifle, agree it's best to go to a local match and see if you can shoot some of the competitors' rifles. Your choice of pistol is probably as good as it gets, IMO. The NMV are perfect. (I like the Bisley in 5.5 inch), If you really want to buy a rifle that will work for you out of the box, contact Cody Conhager, (codyscowboyshop.com) and order a codymatic. Tubby, you seem to be well versed on shooting and reloading. My advise is to find a pistol and rifle that feels comfortable to you. Your 1897 shotguns are very popular in this sport. The Ruger Vaquero is a nice pistol, and my wife shoots a pair, but they don't feel comfortable to me. I prefer the Uberti 1873 Cattleman Colt clone. I have them in pairs of 32-20, 38/357, and 45 Colt with 45 ACP conversion cylinders. Rifles I have Uberti 1873's in 32-20 and 38/357, two Marlin 1894's in 38/357, an original Winchester 92 in 32-20, Rossi 92 in 45 Colt, and a Browning 53 in 32-20, all which are great rifles. The Winchester 73 you are interested in is also a very fine rifle. As for caliber it's really your choice. Double check the firearm / caliber requirement in the cowboy shooting class(es) your interested in shooting. My only advise is some reloading components are more readily available and cheaper than others which is important if you are going to do a lot of shooting. If you plan on shooting black powder then I would probably go with a bottleneck case like 44/40 if I was purchasing my first pistols / rifle, however the other calibers shoot black just fine too. Other than that have fun and welcome! CAS is a speed shooting sport so getting back on target quickly after every shot is critical for having the best stage times. Revolvers shooting 38 Special rounds can be loaded for lower recoil than those shooting larger caliber. The cost savings is real too. YouTube has many videos with CAS tutorials - some posted by those who frequent this Wire. Search and you will quickly find them. You're asking for opinions. The responses you'll get will all be correct..................but might not be right for you. 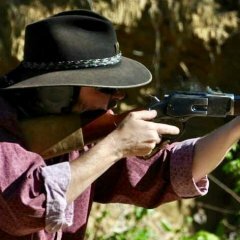 The best advice you've been given so far is to go to as many matches as possible and try out as many different rifle/pistol combinations as you can. After that you'll have a much better base of information from which to make your decision. as mentioned before go to a couple of matches and try out the firearms--cowboys love to show off their guns. I agree with those who have suggested you go to some matches and try different guns to see which is a better 'fit' for you. Keep in mind that some categories have restrictions on what type guns can be used, so if you're interested in one of those categories be sure you pick a gun that is legal for it. Howdy Tubby, if like you said you want to shoot a few matches, have fun but not make it your focus. I probably would just go with stock gun's for now. If you change your mind later down the road you can always have a smith slick em up for you, even spring kit's and little thing's you can do yourself depending on how competitive you want to be. My bet is your gonna like this ride once ya get on it. There's a lot more to look forward to than just the shooting part of it. Have fun and enjoy it!!! Grab a 40+ lever rifle and a 1911 and give Wild Bunch a go as well. No matter what draws you to this sport, nothing frustrates a shooter quicker than equipment that doesn’t work. Find a working gunsmith that actually goes to shoots and services guns. They all break because of the abuse we put them through in our game. But these gunsmiths can give you some solid advice. 3. Necked cases (44-40 and such) best universal for smokeless to black powder. 6. Come to the dark side, we have cookies. Best of luck in your new hobby. I hope to see you down the trail. I pray you grow to love it the way we do! About '73s, Hubby (gun boy) wouldn't let me have one until he saw the Miroku. I got one in .38 for Christmas in 2017. He had; we still have a Uberti in .45. I shot it once and didn't see any problem shooting. It was in a WBAS side match when I wanted to use two rifles on one stage. The other .45 was the Marlin I usually shoot. 32 - A lot more bullets for your dollar. You will find that they lack the weight to knock over some knock down targets. 38 - Good compromise on price and power. 100gr bullets for light loads and 158 for those knock downs. 44/45 - Great power. Less bullets for your money. Bottle neck case are more expensive but seal the chamber well. Great choice if shooting smoky stuff. Pistols - Try them all before you buy!!!!!!! The back strap design, the hammer, the size of the frame are all different and the feel will determine what you like as well as your shooting style. Don't pass up looking at the 3/4 size revolvers. Rifle - There is a reason that most rifles are 66/73 and Marlins. Even among these you will find better fits with stock design and barrel length. TRY BEFORE YOU BUY. 97 - Light, and fast but can lead many to train wrecks. When they work well they are a very fast to operate. Double - There is NOT SO EXPENSIVE and then there is EXPENSIVE. The good ones are not cheap. Fit is everything. Wood stocks are prone to breakage on many models. I am in Minnesota. Looks like there are several groups in the area. They also meet every Wednesday night at my local gun club. I intend to take up their offer and try out their hardware. The challenge for for me is everything feels so different that sometimes it’s hard to determine which is better. I did already figure out that I don’t like the “birds head” style grips. I like to match calibers handguns and rifle. This makes reloading ammo easier. Only one caliber to bring to the shoot. Start out simple then try other things. I find the challenge of new guns to shoot more fun. Handgun grips are like gloves for your hands , You have to try on different ones to find what you like. Just shooting a few rounds from a gun is like sitting in a new car ,you really need to shoot a match with something to decide. The challenge for for me is everything feels so different that sometimes it’s hard to determine which is better. As you well know, there's been a decades long debate on the best gun/caliber for home defense. My opinion has always been, "Use the one you can hit your target with. A hit with a 22 is better than a miss with a 44." I feel exactly the same when it comes to cowboy guns, choose the ones you can hit your targets with. Take the rifle for instance. As Ace of Hearts said, there are many different configurations. One of the major differences in rifles is the style of stock, straight or pistol grip. Grab them one at a time and shoulder them with your eyes closed. Once shouldered open your eyes and see which one is on target. That style of stock is better for you. Also notice the different lever angles between those two styles of stocks. That will make a difference in the feel when you cycle the action. Concentrate on that feel as you're firing and see if one feels more natural to you. Those are just very small examples of how different styles feel and will work for or against you. But the biggest thing to remember is that just holding and looking at all the different configurations available isn't enough, you have to take them out and shoot them. One thing you may want to consider, since you like 3gun shooting, is Wild Bunch. I chose 44-40 because I already owned a 73 Winchester in that caliber. Soon learned about the WB category that requires the rifle to be .40 cal or larger, no 38s allowed. Another caliber that works well is 44 magnum/44 special, my son shoots these. You can usually find a pair of 44 new model vaqueros for less than a pair of 38s, just because the 38s are in higher demand. One thing you may want to consider, since you like 3gun shooting, is Wild Bunch. I chose 44-40 because I already owned a 73 Winchester in that caliber. Soon learned about the WB category that requires the rifle to be .40 cal or larger, no 38s allowed. If you have a club in your area that offers Wild Bunch matches, having a rifle legal for both games (Wild Bunch Action Shooting is a separate sport, not a category within cowboy action shooting) is a plus. Another point in favor of .44/40 is that it works really well with black powder. Also, a Winchester 1897 in 12 gauge is the only shotgun legal for both games. SASS has a separate forum for Wild Bunch if you need more info. A buncha these fellas make setting up for cowboy shootin’ sound like a lot of work. Just go buy the Miroku right now. It’s a gorgeous rifle and competitive right out of the box. Rifle problem solved. Then all you have to figure out is pump vs. SxS and Rooger vs. everything else. It’s simple. Just remember two things, you gotta start somewhere and we don’t buy guns, we just rent them. A buncha these fellas make setting up for cowboy shootin’ sound like a lot of work. Just go by the Miroku right now. It’s a gorgeous rifle and competitive right out of the box. Rifle problem solved. Then all you have to figure out is pump vs. SxS and Rooger vs. everything else. It’s simple. Just remember two things, you gotta start somewhere and we don’t buy guns, we just rent them. Yep, about the Miroku! First time Hubby set hands on one, he ordered one for me. I made this a couple of years back... still relevant though! It might answer a few of your questions and help you on your way to choosing gear. AS a very new member myself I'd like to say please ensure if you are buying a weapon sight unseen ensure you get someone you know to go and check it out first or at lease get a video of it being operated at speed to ensure it functions like advertised. I just bought a race ready shotgun that is nothing more than a dysfunctional mantle piece and am now looking for another one. What did you buy? Did you buy it on here?